NFL Week 11 is shaping up to be pretty exciting with the dominant defense of the Minnesota Vikings pitted against the top-notch offense of the Los Angeles Rams. Both teams are 7-2 after nine games in the season and are playing like genuine super bowl contenders despite their dismal showing last season. 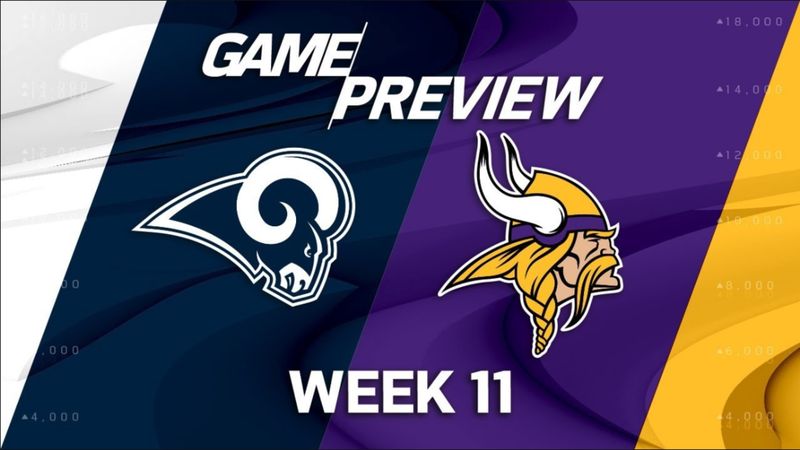 The game will be especially exciting since the Vikings own a 4-1 home record this season so far and the Rams are 4-0 on the road. Both teams are equally matched, and victory would come down to who can finish in the fourth quarter. The Vikings Stefon Diggs and Adam Thielen are two of the players that can change the outcome of the game on Sunday and should have a big impact in letsRUMBL. This duo of wide receivers is among the best in the league and will be a handful for the Rams cornerbacks on Sunday. Nickell Robey-Coleman will likely be covering Thielen, and Tremaine Johnson will try to contain Diggs. This will be extremely difficult due to the speed and power that these Vikings wide receivers possess. They also can turn short gains into long ones with their evasiveness after the catch. If they get any amount of space, this could spell disaster for the Rams, and they are players who could rack up huge numbers in letsRUMBL. Todd Gurley from the Rams is quickly becoming one of their most impactful players. His receiving game has blossomed, and he is one of the best on the ground in the league. He is well supported by Sean McVay who works to create space for Gurley allowing him to score big points. Anthony Barr, one of the leading linebackers in the NFL, could limit Gurley’s effectiveness. He is fast enough to run with Gurley and is good in coverage. Another player to watch is Robert Woods; he is a very effective wide receiver who works well in tandem with quarterback Jared Goff for the Rams. These two players are capable of setting up and delivering big plays for their team, and should look to put up big numbers in letsRUMBL. However, Vikings Cornerbacks Trae Waynes and Xavier Rhodes will target Woods and attempt to limit his effectiveness. This in turn may limit the effectiveness of that quarterback Jared Goff in the game. Jerick McKinnon has been an electric running back this season for the Vikings. So far, he has racked up 319 yards on 79 carries as well as 30 receptions and three touchdowns. If he continues to play well, he could have value as a 4 star player in letsRUMBL. This game should be a close matchup between a defensive powerhouse against a top offensive team. Both teams are contenders in the NFC and have several players with a high fantasy value and the ability to turn the game in their team's favor. The team that plays the best football on Sunday will win, however, the Vikings get a slight edge due to the game being played on their home turf. This is a marquee matchup to watch, and get these players on your letsRUMBL squad! NBA daily fantasy sports player picks: Which players do you need for the weekend? WHO WILL BE THE NBA CHAMPIONS FOR 2017?